The Team from Deus Ex Machina has done it again, building and customizing a mean-looking bike with a 1960’s flair in the Deusky 510. 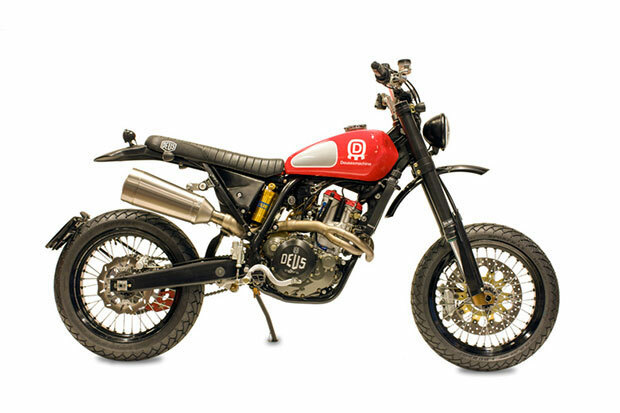 The original basis for the design was the impressive Husqvarna 510R SM, of Supermoto racing fame, but the modifications on this version include lots of extra horsepower, lower weight, some added lamps, and license plate, just as a start. The next change was with the gas tank, replacing the original plastic version with an aluminum model emblazed with the white-on-red Deus Ex Machina logo. The fenders, both front and back, were then upgraded to aluminum as well, the rear frame was slightly modified, new racing radiators were installed, and the suspension was enhanced using Ohlins rear shocks and a new frontal internal kit. More design mods followed, with a more compact electrical racing wiring system being installed next, a titanium exhaust by Leovince was added, the rear seat was entirely rebuilt, and a new Dayton tachometer was included. The beastly Deusky 510 is painted in a flat black which lets the red tank and racing cylinder head really pop! This is one beautiful machine that handles well on any terrain, and definitely turns the heads of everyone that it passes! Join thousands of fans and receive our monthly newsletter featuring all the best bits!